Rosemary is a great plant to have around. It’s fragrant, it’s useful in all kinds of recipes, and it’s quite tough. It likes full sun and well-drained soil. It can only survive down to 20 F. (-6 C.), so in cool climates, it’s best grown as a container plant. In mild climates, however, it makes a great shrub in outdoor beds, where it blooms spectacularly in the winter. One very good variety for colorful blooms is the Tuscan blue. Keep reading to learn more about growing Tuscan blue rosemary and how to care for Tuscan blue rosemary plants. All varieties of rosemary bloom with delicate flowers. The color of the flowers can vary from type to type, ranging from shades of pink to blue to white. Tuscan blue rosemary plants (Rosmarinus officinalis ‘Tuscan Blue’), true to their name, produce deep blue to violet flowers. The plant should bloom from winter to spring. Flowers may come back again for a smaller showing in summer or autumn. 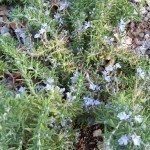 Tuscan blue rosemary care is relatively easy. Tuscan blue rosemary plants grow in a more upright pattern than many other rosemary varieties. They can grow up to 7 feet tall and 2 feet wide. If you want to keep your plant more compact, you can prune it back heavily (by as much as ½) in the spring, after it has finished blooming. Tuscan blue rosemary hardiness is a little better than that of other rosemary varieties. It should be able to survive down to about 15 F. (-9 C.), or USDA zone 8. If you live in a colder climate than that, you may be able to overwinter your Tuscan blue rosemary by heavily mulching it in the fall and planting it in a spot that’s sheltered from the wind but still receives full sun. If you want to be sure your rosemary survives the winter, you should grow it as a container plant and bring it indoors for the cold months.